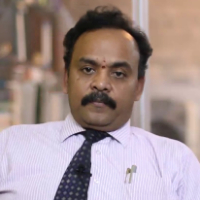 Dr Satheesh Madhav did his B Pharm in 1992 from VL College of Pharmacy, Raichur, an M Pharma in Pharmaceutics from Govt College of Pharmacy Bangalore University, Karnataka in 1994 & PhD in Pharmaceutical Technology from Jadavpur University, Kolkata, 2004. He is having 24 years of administration, Research & Teaching experience. He has filed 47 Indian patents, guided more than 10 PhD students & 75 M Pharma students. He has 35 publications & 135 presentations in his credit & he is a recipient of Young Scientist Award, UCOST in 2010 as well. Pharmacy is an art and science of compunding of medicines and having ability to invent new medicines for maintaining better health of society. "After completing B Pharma from VL College of Pharmacy, Raichur, an M Pharma in Pharmaceutics from Govt College of Pharmacy Bangalore University, Karnataka & PhD in Pharmaceutical Technology from Jadavpur University, Kolkata, I started my career as a principal. I have 24 years of experience in teaching & Research."